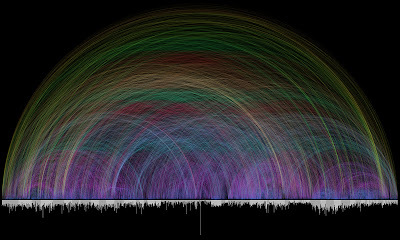 Biblical Studies and Technological Tools: Visualization Fun! Okay, I'm basically riffing on some neat stuff posted on a couple other blogs. This project started after receiving an email from Christoph Römhild. He had compiled a list of cross-references found in the Bible and was looking for advice on how to visualize these connections. ... Due to the extremely high number of cross-references, this lands more on the aesthetic side of the information visualization spectrum. Different colors are used for various arc lengths, creating a rainbow like effect. The bar graph running along the bottom shows every chapter in the Bible and their respective lengths (in verses). Books alternate in color between white and light gray. You should be able to pick out Ps 119 (the long bar in the middle) and the Gospels about 3/4 way to the right. As Harrison says, this isn't too insightful, but I do like the Genesis/Revelation and the prophets/Gospels connections. I can use it as a logo for my OT in the NT class! And now, once again, here is proof that even a blind squirrel occasionally finds a nut and that a bazillion monkeys typing on the Internet can get close to the truth. 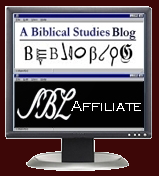 Over on the OpenBible.info blog (and this blogger is not a blind squirrel or one of the monkeys! ), some examples were given of Google's new experimental timeline view. What it basically does is take a search parameter and then look for dates that are included with the entries of the returned hits. This means, of course, that a search entry and a reference to a date might have absolutely no relationship to each other, but it will still show up on the graph. 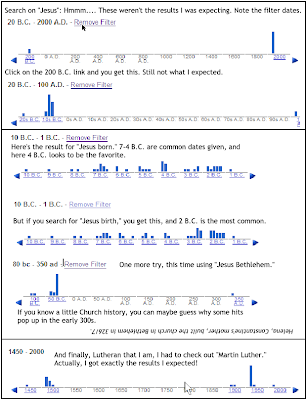 The OpenBible.info blog gave some examples of the dating of the Exodus and the birth and crucifixion of Jesus. They do kind of help highlight issues in dating and significant moments. I tried out a few more. Note that you can keep clicking down to get more and more specific time periods. Oddly for "Martin Luther," 31 October 1517 hardly makes a blip. Enough fun for today. If you play around with it for yourself (in the search bar, replace "data" with your own search term/s), let me know if you get anything worthwhile or interesting.